Silver Up for a Big Move? Could Silver Be Winding Up for a Big Move? This spring, gold vastly outperformed silver, leaving the white metal looking for direction. 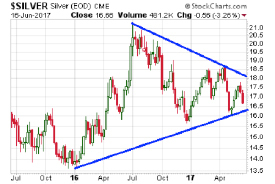 The silver chart shows prices winding up within a huge wedge pattern. As the trading range gets narrower and narrower, it sets up a resolution in the form of a very strong directional move one way or the other. A few more weeks of consolidation are still possible before a decisive break out from the pattern. In 2016, silver was very strong in the first half of the year and weak in the second half. The first half of 2017 has been something of a wash, setting up something potentially big in the back half of the year.